Incat Crowther is pleased to announce that construction is well advanced on three new catamaran ferries to its design. Two 32-metre ferries and one 24-metre ferry will be operated by Riverside Marine to transport workers between Gladstone, Queensland and the new LNG plant on Curtis Island. By focusing on passenger accommodation, seakeeping, efficiency and range, Riverside Marine and Incat Crowther have developed a 3-vessel fleet which offers maximum capacity combined with maximum flexibility. 2 x 32m CATAMARAN FERRIES Construction of the first of a pair of 32 metre ferries is well advanced at Brisbane Ship Constructions. These vessels will be configured to carry 399 passengers for the Curtis Island operation. The layout of the boat has been developed to allow it to be converted to a more spacious cabin layout in its second life, making it suitable for longer duration transfers and tours. The vessels will feature a large main deck cabin with forward and midship boarding doors and ramps. The cabin accommodates 268 passengers in forward facing seats. The aft deck will be configured with a cargo zone for carrying items such as tool boxes and supplies. 5 toilets are also located on the aft deck, one of which is wheelchair-accessible. 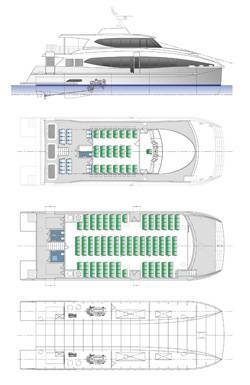 The upper deck is accessible via both internal and external stairs, and will feature a cabin with 132 seats. Outdoor seats are also to be fitted to the aft end of this deck and will be protected from the sun by a large roof overhang. The vessels will be powered by a pair of Caterpillar C32 main engines, each rated at 970kW at 2100 rpm. Power is transmitted via ZF3050 gearboxes to a pair of five-bladed propellers. The vessel will have a service speed of 25 knots @85% MCR. Meanwhile, construction is underway at Marine Engineering Consultants on a 24m vessel, similar to the Fantasea Sunrise, delivered earlier this year. By utilizing this vessel in conjunction with the large vessel, Riverside Marine can minimize operating costs when passenger numbers fluctuate. The vessel is a high capacity variant of the Fantasea Suirise, and can be converted to operate on any of Riverside Marine’s routes, both on the Great Barrier Reef and in Sydney. This vessel will have seats for 180 passengers in the main deck cabin and 46 passengers in the upper deck cabin, with an additional 20 outdoor passenger seats on the upper deck. A total of four toilets will be fitted, with one being located on the upper deck. Like the 32m vessels, midship boarding doors will be fitted, as well as boarding ramps. The 24m vessel will be powered by a pair of Yanmar 6AYM-WET main engines each producing 610kW @ 1900rpm, giving the vessel a service speed of 25 knots @85% MCR. The three vessels are due to be delivered throughout 2012. Incat Crowther believes the work performed with Riverside Marine creates operational flexibility and adds commercial value to these products.